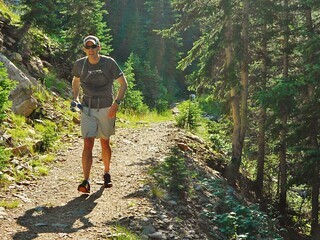 On Saturday, Tilden and I ran the High Lonesome Trail Loop; up Devil’s Thumb Pass, across the Continental Divide, and then down the King Lake Trail. It took us about 5.5 hours, with an average rate of 20 minutes per mile (including the uphill portions!). I was very happy with the run, as I haven’t been running in a while, outside of the occasional 20 minutes in the gym. My knee was bothering me a little bit on the way down, but other than that, no other problems. Also, bonus points for Tilden. He brought his water filter, so we never had to carry more than a liter of water which really made the run go more smoothly. Not having to carry the extra weight was super nice! 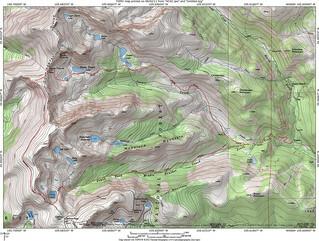 The High Lonesome Loop is roughly 16.4 miles with several thousand feet of gain, in an amazing alpine setting. I would estimate about 85% of the run is on single track, with the rest being on a gravel road. Every weekend, there are hundreds of people summitting Mt. Bierstadt via the standard West Slopes, from Guanella Pass. I was purposely putting off climbing Mt. Bierstadt because of my dislike for encountering hoards of people in the wilderness. Back in 2008, I had climbed Mt. Evans via the 2nd Apron and that was super fun…until I got to the summit and encountered the masses. 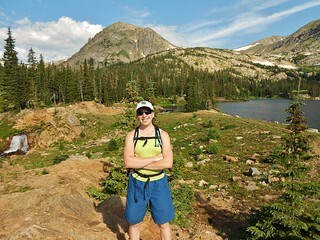 In talking with Erin about this, she suggested we overnight at Abyss Lake and climb Mt. Bierstadt from the Northeast side. We talked about doing the Sawtooth over to Evans, while we were there, as it looked like a bunch of fun. Doing Mt. 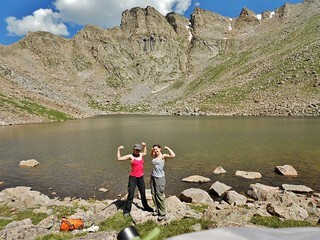 Bierstadt via Abyss Lake, turns the experience into an overnight backpack, which adds a bit of adventure and a great deal of mileage. It was 23.4 miles round trip with about 4,600 ft of elevation gain. 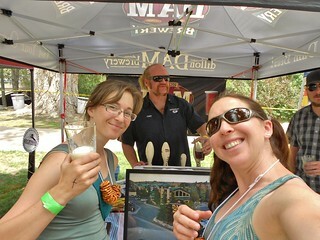 Rocking Out at the Colorado Brewer’s Rendezvous! After a restless night in the truck, we headed to Patio Pancake Place to fill our bellies with good ole’ fashioned breakfast. The food there was very affordable and the serving sizes were generous. We were delighted with our food and service. Today, we would be attending the 17th Annual CO Brewers Rendezvous, so it was important to have a hearty meal. The CBR is sponsored by the Colorado Brewers Guild. 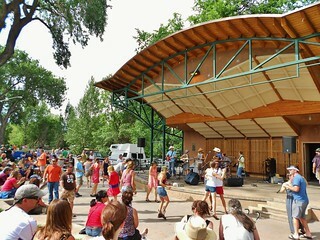 It is therefore, almost all local breweries who are in Colorado. This year, there were 74 brewers attending. During the event, the brewers take the time to tell you how they made the beer, critical ingredients, and their goals for the flavor. My Favorite was a Toasted Pecan Bourbon Barrel Aged Brown Ale, by DAM Brewery of Dillon, CO. Yum! Erin Really Liked Three Barrel Brewery’s Pemba Sherpa Saison Ale. For Erin, it was an opportunity to learn how she might improve her future home brews. For me, the details were a bit mind numbing – but then, so was the copious amounts of alcohol. Erin and I had a fabulous plan for the upcoming weekend adventure. 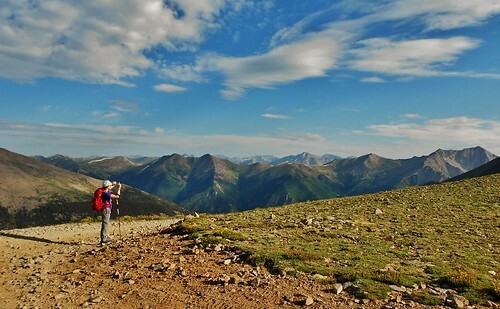 First, drive to the Sawatch Mountains and climb a 14’er. 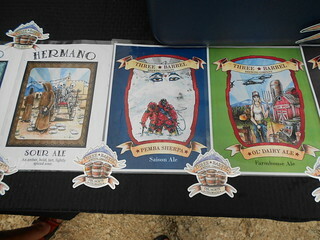 Second, attend the 17th Annual Colorado Brewer’s Rendezvous in Salida. We wondered, how could we have a more perfect weekend? We selected Mt. 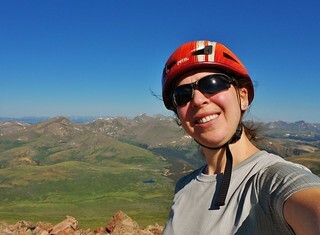 Antero as the target, with Cronin Peak, a Centennial 13’er as a bonus. These peaks are relatively close to Salida, we had not climbed them yet, and we *thought* we had a good chance of driving to the higher trailhead (Erin’s friend had recently driven up to the 4wd lot in her Subaru). The Amazing View! 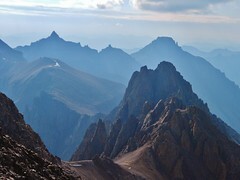 Cirque Mountain, Teakettle Mountain, and Potosi Peak. 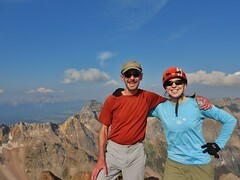 Jeff and I climbed the uber classic southwest ridge of Mt. Sneffels. 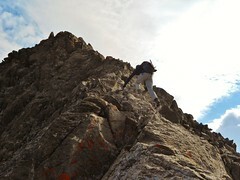 Jeff had mentioned, on my Pigeon/Turret trip last summer, how he was interested in climbing the ridge route on Sneffels. 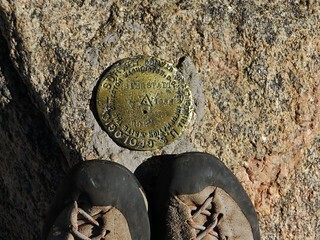 In the meantime, I had heard nothing but good things about it from other folks in the Colorado Mountain Club. So, finally, after thinking and dreaming about the route for year, I got to climb it! The southwest ridge did not disappoint; it truly is a classic ridge scramble and, as such, is featured as one of the premier routes in the CO Scrambles book. You are currently browsing the climbergirl blog blog archives for July, 2013.